We were chosen as one of the 1000 Best Brokers in Germany in cooperation with Wirtschaftswoche magazine, for long-term excellence and experience, special commitment to customers and above-average customer reviews. 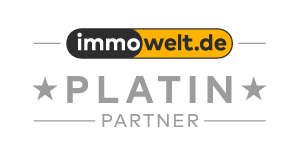 We are also proud of the positive reviews on Immobilien Scout 24, who offer their customers a chance to evaluate their real estate agents. See some of the reviews here. We are a member of the Real Estate Association Germany and the Federation of Real Estate Consultants, Brokers, Managers and Experts.